Free PC-to-PC calls via services such as Skype are becoming popular, but their main disadvantage is that your computer must be on, and you must be in front of it to make calls. Bluetooth headsets give you greater freedom, but are no substitute for using a normal phone.The USB Cordless Dual Phone is a Dect handset that can make and receive calls over both the Internet via Skype and traditional carriers such as BT. 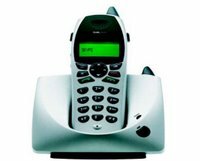 It is easy to set up; you just plug a telephone line into the base unit, which is also connected to a spare USB port, load the software; the phone is then discovered and you are ready to make calls. The whole process took under five minutes, helped by the simple instructions. To make Skype calls, ensure the service is working on your PC – the phone will find whichever account is logged on. The handset displays all contacts currently online so you simply scroll to the name you want, hit the green button marked PC and the call is made. Call clarity over both Skype and BT is excellent, even when some distance from the base unit. You can set different ring tones for incoming Skype or BT calls and use it for making Skype Out, landline or mobile calls. It will also receive Skype In and Skype conference calls, the only element that is missing is instant messaging using the keypad. It’s a great phone that’s really easy to use and allows you to make free or low-cost Skype calls or normal BT landline calls, wherever you are in your home. Our only gripes are its cost and that you are restricted to using Skype for Internet calls. But, if you are already a heavy Skype user or contemplating signing up, it’s worth the money.